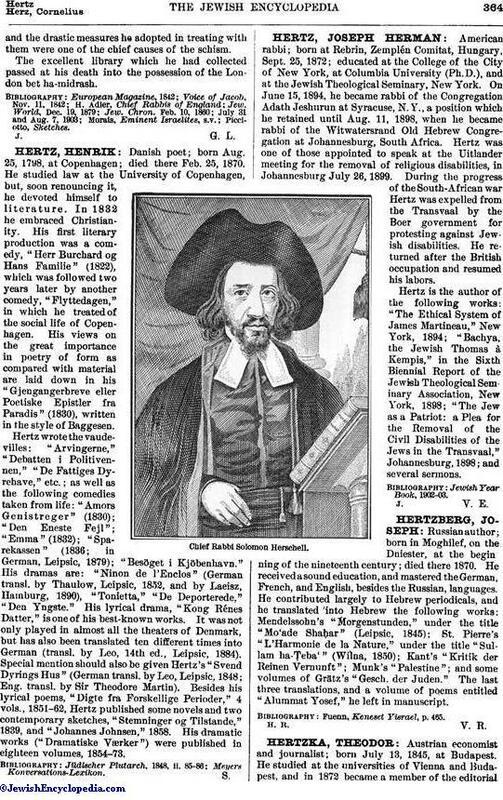 Chief rabbi of the Ashkenazim in England; born in London 1762, during the rabbinate of his father, R. Hirsch Levin; died there Oct. 31, 1842. His family could boast a long genealogy of learned men, including R. Meïr of Padua. 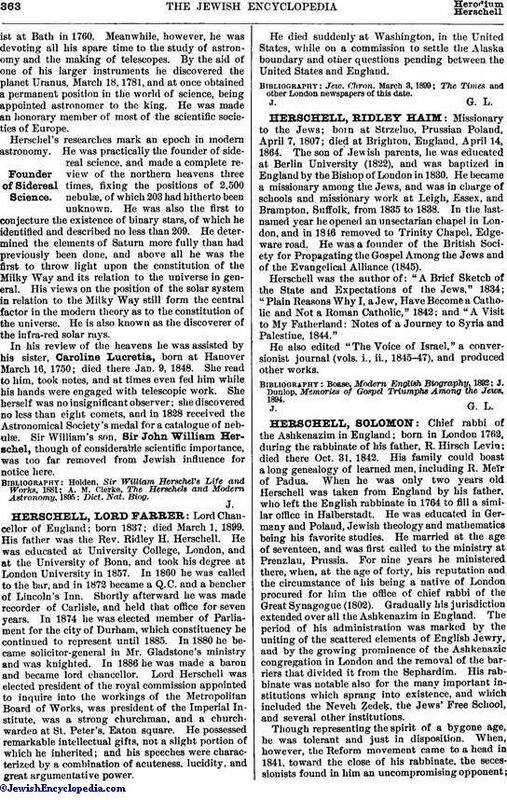 When he was only two years old Herschell was taken from England by his father, who left the English rabbinate in 1764 to fill a similar office in Halberstadt. He was educated in Germany and Poland, Jewish theology and mathematics being his favorite studies. He married at the age of seventeen, and was first called to the ministry at Prenzlau, Prussia. For nine years he ministered there, when, at the age of forty, his reputation and the circumstance of his being a native of London procured for him the office of chief rabbi of the Great Synagogue (1802). Gradually his jurisdiction extended over all the Ashkenazim in England. The period of his administration was marked by the uniting of the scattered elements of English Jewry, and by the growing prominence of the Ashkenazic congregation in London and the removal of the barriers that divided it from the Sephardim. His rabbinate was notable also for the many important institutions which sprang into existence, and which included the Neveh Ẓedeḳ, the Jews' Free School, and several other institutions. Though representing the spirit of a bygone age, he was tolerant and just in disposition. When, however, the Reform movement came to a head in 1841, toward the close of his rabbinate, the secessionists found in him an uncompromising opponent;and the drastic measures he adopted in treating with them were one of the chief causes of the schism. The excellent library which he had collected passed at his death into the possession of the London bet ha-midrash.